VIDEO DESC: Matt Dickens is infront of a red brick background signing. The video has no sound. Video fades to flyer description of signed content. Interpreters will be provided for both workshop and meeting. Sometimes as interpreters we accurately convey the content of a message, but matching the source language’s register and shades of meaning/implied meaning in the target language can be difficult. In this workshop we will explore register, connotation, and denotation within language. 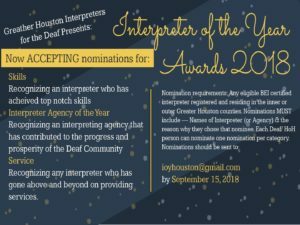 We will explore various English as well as ASL interpretations and discuss why certain interpretations may ultimately be closer linguistic and cultural equivalents than others. HEY EVERYONE! We, hope everyone is having a nice spring break as GHID took the month of March off. 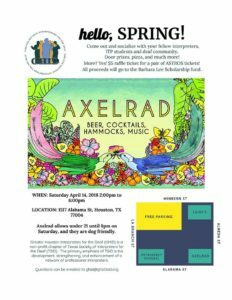 We will be back April 14th with a ‘hello, Spring!’ sociat Axlerad 2-6pm, then May 19th with our last general meeting and elections. Please save the dates and check out the flyer for details on our social coming up. Please share with your community, colleagues, and ITP students. If you have any questions about the elections or are interested in running please contact Kristina Rodriguez at president@ghid.tsid.org. If there are any agencies or individuals interested in donating door prizes please let us know at ghid@ghid.tsid.org. Welcome to GHID’s new website! Thank you to TSID Webmaster Andrew Cohen for helping us set up our new website. Thank you for your patience as we get the site up and ready! Author ghidghidPosted on October 15, 2017 March 22, 2018 Categories AnnouncementsLeave a comment on Welcome to GHID’s new website!